Today’s 272-ship fleet isn’t nearly enough. The U.S. needs 350 ships to meet the rising global dangers. Late last week China confirmed that it is building its first aircraft carrier from scratch, adding to a fleet that includes a Russian-made carrier. The news cast U.S. military policy in a particularly unsettling light: While China’s naval power expands, America has deliberately reduced its presence on the seas. The Navy—after nearly $1 trillion of Defense Department cuts, in part mandated by the 2011 budget-sequestration deal between Congress and the Obama administration—is already down to 272 ships. That means the U.S. fleet is less than half its size at the close of the Reagan administration nearly 30 years ago (and down by 13 ships since 2009). The Navy had intended to increase the fleet to 308 ships, including 12 that will replace the nation’s aging ballistic-missile submarine deterrent. But in a mid-December memo, Defense Secretary Ash Carter told the Navy to cut the number of ships it plans to build in favor of placing more-advanced technology aboard the existing fleet. Secretary Carter’s plan implies that the deterrent effect of a constant U.S. presence in the world is less important than the Navy’s ability to fight and win wars with the advanced weapons he favors. That assumption is mistaken. We need both the ability to be present, which demands more ships than we have, and the related power to win a war if deterrence doesn’t work. Even the Navy’s now-endangered plan for 308 new ships was far below the approximately 350 combat ships needed to achieve this aim. • Aircraft carriers. Applying power requires the anti-submarine, anti-surface warfare, surveillance and strike ability of aircraft carriers. It requires an increase from the congressionally legislated level of 11 aircraft carriers to 16, enough so that we could maintain at least one carrier strike group in the West Pacific, the Persian Gulf, and return powerful U.S. naval forces to the Mediterranean. • Supply ships. The ability to shape events on land is linked to the ability to operate independently of it. Supply ships assure this. The U.S. currently has 29 such vessels but it needs to double the number so that it can provision a larger fleet in the West Pacific and return to the Mediterranean in strength. • Submarines. The Pentagon’s annual report last April on Chinese military power predicts that China will have between 69 and 78 submarines by 2020. The U.S. expects to have about 70 submarines in the same year. Yet repairs, maintenance and rotational cycles mean that only about 25% can be deployed at a time and must be spread around the world. The U.S. will likely retain its qualitative advantage, but the size and quietness of China’s submarine fleet means that America needs a total of 90 submarines to provide a healthy nuclear deterrent, shadow or hunt enemy subs, assure dominance in the West Pacific, and meet additional global challenges. • Amphibious craft. Increased Russian naval presence in the Mediterranean and that of China and Iran as well as Islamic State’s occupation of Sirte on the Libyan coast also demand a return to the amphibious presence that the U.S. maintained during the Cold War. The possibility that China would seize and hold islands in the West Pacific as a means of extending its strategic reach also emphasizes the need for greater amphibious capability. The U.S. Navy and Marine Corps should have 45 ships for these missions, an increase of nearly 50% over the current level. • Large surface combatants, destroyers and cruisers. 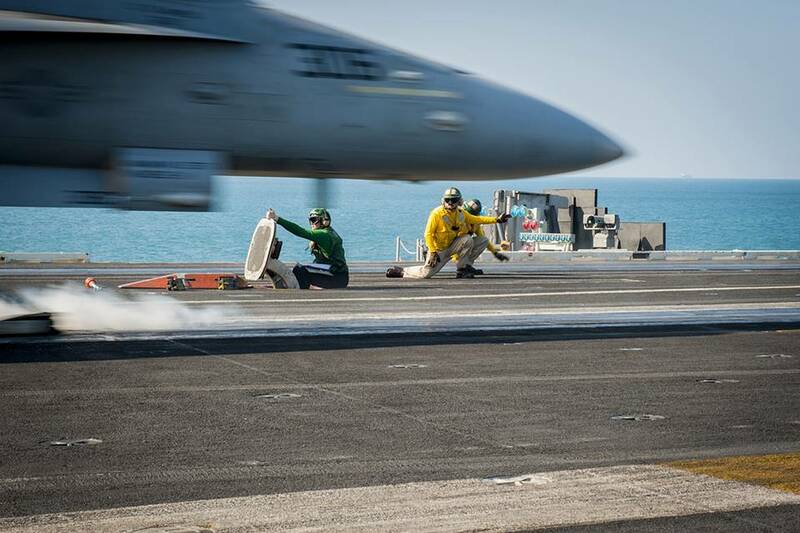 These remain the U.S. fleet’s backbone. They hunt for subs and other surface ships, project power inland, and protect—and are protected by—aircraft carriers. For the foreseeable future they will be the main defense against proliferating missiles that can be launched against ships from land, air and sea. Weighing China’s ability to concentrate naval forces in its adjacent seas against the U.S.’s global commitments, a total of 100 large surface combatants—an increase from the planned 88—is the minimum required to protect each of America’s 16 carriers with five ships. • Small combatant ships. Defense Secretary Carter wants to cut the number of the small naval combatants, called littoral combat ships (LCS), to 40 from 52. Even in its upgraded version, the LCS falls short of the ability both to defend itself and take the fight to an enemy. Instead of building 40 ill-defended combatants, the Navy needs a minimum of 30 new small combatants that possess a real frigate’s offensive and defensive ability. • High-speed vessels. Current plans are right when they call for 11 of the low-cost, unarmed and fast twin-hulled ships that can transport small Army or Marine units along with their equipment. The fleet described here would number 350 ships, about 240 ships fewer than the Reagan Navy, and 13% larger than the combat fleet the Navy currently seeks. Using the Congressional Budget Office’s cost estimates, this would require an annual $24 billion shipbuilding expense. That means a 45% increase of the current $16.5 billion shipbuilding budget, or an added $7.5 billion yearly to the shipbuilding portion of the Navy’s budget to reach a 350-ship fleet by 2045. China’s shipbuilding plans, as well as other global challenges, show why a larger fleet is needed sooner than 30 years from now. Achieving this would increase annual shipbuilding budgets. Yes, this is expensive, but it’s cheaper than surrendering America’s global naval dominance—and that’s where the nation is headed, given the trend lines as China’s fleet grows. The expense can be moderated. One example is the shipbuilding economies of scale found in the 1980s: The contracts for the aircraft carriers USS George Washington and USS Abraham Lincoln were signed on the same day and the great ships were built nearly simultaneously, saving about $700 million. More savings are possible if a new president were to overhaul the top-heavy Pentagon and make sorely needed reforms of military management. Yet the $7.5 billion difference between the Navy’s insufficient current plan and the minimum required to meet foreseeable commitments is a fraction of even the Obama administration’s defense budget. What the nation can’t afford is to retreat as menaces increase abroad. Mr. Cropsey is director of the Hudson Institute’s Center for American Seapower. He served as a naval officer and as deputy undersecretary of the Navy in the Reagan and George H.W. Bush administrations. Is military aviation getting any safer? New mishap data shows mixed results. Nothing Projects Power Like an Aircraft Carrier. Does the Pentagon Think Otherwise?